Haing Somnang Ngor (Khmer: ហ៊ាំង សំណាង ង៉ោ; Chinese: 吳漢潤; pinyin: Wú Hànrùn; March 22, 1940 – February 25, 1996) was a Cambodian American gynecologist, obstetrician, actor, author, and refugee. He is best remembered for winning the Academy Award for Best Supporting Actor in 1985 for his debut performance in the film The Killing Fields (1984), in which he portrayed Cambodian journalist and refugee Dith Pran. Ngor is the first (and to date, only) man of Asian descent to ever win the Academy Award for Best Supporting Actor. He survived three terms in Cambodian prison camps, using his medical knowledge to keep himself alive by eating beetles, termites, and scorpions; he eventually crawled between Khmer Rouge and Vietnamese lines to safety in a Red Cross refugee camp. His mother was Khmer and his father was of Chinese Teochew descent. Ngor and Harold Russell are the only two non-professional actors to win an Academy Award in an acting category. Born in Samrong Young, Bati district, Takeo province Cambodia, Ngor trained as a surgeon and gynecologist. He was practicing in the capital, Phnom Penh, in 1975 when Pol Pot's Khmer Rouge seized control of the country and proclaimed it Democratic Kampuchea. He was compelled to conceal his education, medical skills, and even the fact that he wore glasses to avoid the new regime's intense hostility to intellectuals and professionals. He was expelled from Phnom Penh along with the bulk of its two million inhabitants as part of the Khmer Rouge's "Year Zero" social experiment and imprisoned in a concentration camp along with his wife, My-Huoy, who subsequently died giving birth. Although a gynecologist, he was unable to treat his wife, who required a Caesarean section, as he would have been exposed, and both he and his wife (as well as the child) would very probably have been killed. After the fall of the Khmer Rouge in 1979, Ngor worked as a doctor in a refugee camp in Thailand and left with his niece for the United States on August 30, 1980. In America, Ngor was unable to resume his medical practice, and he did not remarry. Ngor, despite having no previous acting experience, was cast as Dith Pran in The Killing Fields (1984), a role for which he won (among many honors) the Academy Award for Best Supporting Actor, becoming the first Asian to win Best Supporting Actor in debut performance. Ngor was not initially interested in the role of Dith Pran, but interviews with the filmmakers changed his mind, as he recalled that he promised his late wife to tell Cambodia's story to the world. Ngor was the second Asian actor to ever win an Oscar. After appearing in The Killing Fields he told People magazine, "I wanted to show the world how deep starvation is in Cambodia, how many people die under communist regime. My heart is satisfied. I have done something perfect." He also appeared in a supporting role in the 1989 Vietnam War drama The Iron Triangle. He guest-starred in a two-episode storyline on the acclaimed series China Beach (episodes "How to Stay Alive in Vietnam 1 & 2 ") as a wounded Cambodian POW who befriends Colleen McMurphy while under her care. He also guest-starred in an episode of Miami Vice called "The Savage / Duty and Honor". The Dr. Haing S. Ngor Foundation was organized in 1990 by Ngor and Jack Ong. The two actors met in 1989 while filming "The Iron Triangle" and soon after, Pastor Ong's church (Venice Christian Community in Venice, CA) launched Project Cambodia to raise funds to care for orphans and help rebuild the devastated country's infrastructure. Project Cambodia was the original foundation for The Dr. Haing S. Ngor Foundation, which was incorporated in 1997 after Ngor's homicide (Feb. 25, 1996) as a 501 (C) (3) charitable organization. The goals of the Foundation include preserving the legacy of Ngor's accomplishments and human rights endeavors as well as the promotion of Cambodia's history and culture through education, activism and the arts. Ngor's niece, Sophia Ngor Demetri, who testified at the trial of his murderers and whom he brought to the U.S., is the current President of the Foundation; Ong serves as Executive Director. On February 25, 1996, Ngor was shot dead outside his home in Chinatown, in downtown Los Angeles, California. Many Cambodians claimed they had a stake in his estate, with one woman claiming he had married her after coming to the United States. Most of Ngor's Cambodian assets went to his brother, Chan Sarun, while his American assets were used up in legal fees staving off claims to his estate. He was buried at Rose Hills Memorial Park in Whittier, California. Charged with the murder were three reputed members of the "Oriental Lazy Boyz" street gang, who had prior arrests for snatching purses and jewelry. They were tried together in the Superior Court of Los Angeles, though their cases were heard by three separate juries. Prosecutors argued that they killed Ngor because, after handing over his gold Rolex watch willingly, he refused to give them a locket that contained a photo of his deceased wife, My-Huoy. Defense attorneys suggested the murder was a politically motivated killing carried out by sympathizers of the Khmer Rouge but offered no evidence to support this theory. 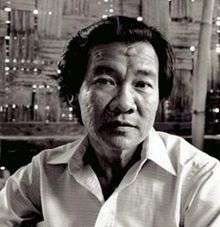 Kang Kek Iew, a former Khmer Rouge official on trial in Cambodia, claimed in November 2009 that Ngor was murdered on Pol Pot's orders, but U.S. investigators did not find him credible. Some criticized the theory that Ngor was killed in a bungled robbery, pointing to $2,900 in cash that had been left behind and the fact that the thieves had not rifled his pockets. Why the thieves would have demanded his locket has never been answered; Ngor typically wore the locket next to his skin under his clothing, so it would not have been in plain sight. As of 2003, the locket has not been recovered. All three were found guilty on April 16, 1998, the same day Pol Pot's death was confirmed in Cambodia. Tak Sun Tan was sentenced to 56 years to life; Indra Lim to 26 years to life; and Jason Chan to life without parole. In 2004, the U.S. District Court for the Central District of California granted Tak Sun Tan's habeas corpus petition, finding that prosecutors had manipulated the jury's sympathy by presenting false evidence. This decision was reversed, and the conviction was ultimately upheld by the United States Court of Appeals for the Ninth Circuit in July 2005. In Season 7, episode 12 of The Simpsons, "Team Homer", Ngor's Best Supporting Actor Oscar had appeared with Ngor's name being crossed out and replaced with Homer's name. About a month after “Team Homer” aired in 1996, Ngor was murdered just outside his home in Los Angeles. Animators then changed the Oscar in question to that of Don Ameche refusing to let the actor’s memory be tarnished by Homer’s theft in subsequent reruns. In Season 1, episode 4 of The Critic, Miserable, Ngor is mentioned by the protagonist's, Jay Sherman, best friend, Jeremy Hawke, as an enemy of Jay and may have a motive to kidnap Jay. It is shown through a quick flashback that Jay on his movie review show said that Ngor "Should have gone to the acting fields." ↑ "Haing S. Ngor footston". Find A Grave. 1999-11-06. Retrieved 2013-08-05. ↑ Liefer, Richard (April 27, 1996). "3 Teens Are Charged With Murder Of `Killing Fields' Actor Haing Ngor". Chicago Tribune. Retrieved September 15, 2016. ↑ "Ngor, Haing S.". Encyclopædia Britannica. Retrieved 2007-10-06. ↑ Ebert, Roger (March 24, 1985). "The day Haing S. Ngor won the Oscar". RogerEbert.com. Retrieved September 15, 2016. ↑ Hyung-chan Kim; Stephen Fugita; Dorothy C. L. Cordova (1999). Distinguished Asian Americans: A Biographical Dictionary. Greenwood Publishing Group. pp. 264–5. ISBN 0-313-28902-6. ↑ Information about the actor Archived July 24, 2008, at the Wayback Machine. 1 2 3 "Biography". Dr. Haing S. Ngor Foundation. Retrieved 2007-10-06. 1 2 "Court Revives Convictions in Murder of 'Killing Fields' Survivor". Metropolitan News. 2005-07-08. Retrieved 2007-10-06. 1 2 "Famous Chinese-Americans in Entertainment: Acting; Haing S. Ngor". Yellow Bridge. Retrieved 2007-10-06. ↑ "Foundation". Dr. Haing S. Ngor Foundation. Retrieved 2007-10-06. ↑ Donahue, Deirdre. "Cambodian Doctor Haing Ngor Turns Actor in the Killing Fields, and Relives His Grisly Past". People.com. Retrieved 2013-08-05. ↑ Ngor, Haing; Roger Warner (2003). Survival in the Killing Fields. New York: Carroll & Graf. pp. 512–513. ISBN 0786713151. ↑ "Haing S. Ngor". Find a grave. Retrieved 2013-08-05. ↑ Jim Hill (February 27, 1996). "Actor Haing Ngor found gunned down outside L.A. home". CNN. Retrieved 2007-09-06.